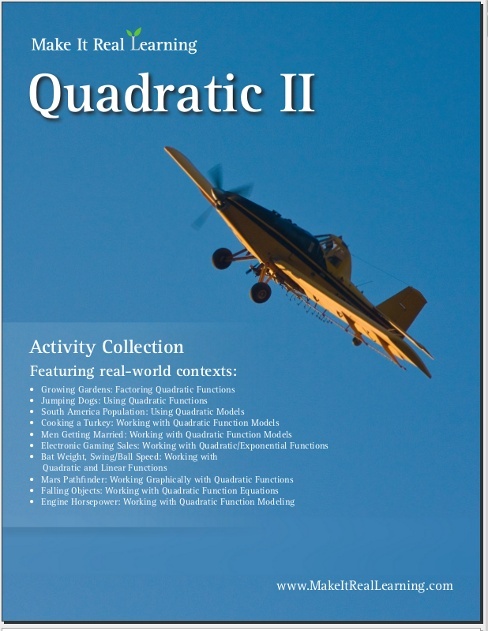 The Make It Real Learning Quadratic Functions II workbook focuses on real-world situations that may be effectively analyzed using quadratic function models. 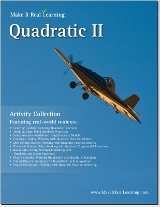 This book suits best high school algebra. From the age when men first get married to the population of South America, learners get to use mathematical modeling in meaningful ways. Each activity integrates real world information, companies, and issues (e.g. Mars Pathfinder, sales of gaming software, bat weight versus ball speed, Mitsubishi 3000 twin-turbo), not just "realistic" data.